Michigan Pressure Washing - House Washing Specialists. We clean pavers, composite decks, concrete and roof washing. Since 2000 Michigan Pressure Washing has been a full service exterior maintenance company offering pressure washing and other cleaning services to residential customers in Michigan. We don't stain, seal or remove old finishes from wood decks and fences. 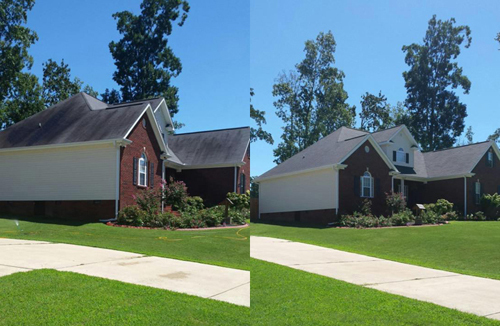 Roof cleaning - Soft Washing method is the process to remove dirt, algae and moss from roofs. Roof cleaning can extend the duration of a roof's ability to function. Algae and other types of build-up often form on parts of roofs that are shaded, and can reduce a roof's life expectancy. The presence of soot, dirt, or biomass can affect how much sunlight is absorbed by a roof and thus the amount of heat a building absorbs. The streaks that are staining the roof are actually a bacteria called Gloeocapsa Magma. This is the main culprit for most of the roof staining in Michigan. There are a few more culprits that also grow up on roofs making a mess of things. Roof top organisms like mildew and algae are unsightly but not as destructive as some of the more aggressive bacteria and fungus. Moss and Lichens also grow where destructive growth has been started by the fungal growths. These algae, mold, mildew, bacteria, lichen and moss directly decompose and break down roofing materials. The good news is that these stains (micro organisms) can be safely removed. Our Soft Wash method and biodegradable cleaning solutions are safe for your roofing material, and results are amazing. In fact, we use less pressure to apply our special cleaning solutions that you get from your garden hose. Asphalt roof cleaning is a sound choice in extending the lifespan of your roof. The build-up of algae, lichen and moss will damage your asphalt shingles, resulting in an early roof replacement. The Asphalt Roof Manufactures Association highly recommends regular cleaning and maintenance of your roof. The choice to maintain your roof’s surface should be an important and informed decision. If left untreated, the shingles will accumulate more organic growth and retain excessive moisture, causing deterioration and decomposition. The valleys of your roof are especially vulnerable to deterioration due to the channeling of rain water, creating a breeding ground for the organisms. Essentially, a roof that retains moisture is a roof that will eventually fail. through three processes: allergy, infection and toxicity." We are the original "Michigan Pressure Washing"